Depending on the age and growing location of the tree, the color of Douglas-fir can vary, but is usually light brown, with hints of yellow or red, as well as darker growth rings. The wood is moderately lustrous, showing a generally straight grain with occasional wavy or curly figuring. The texture ranges from medium to coarse. 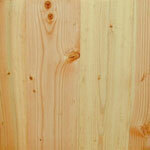 Douglas-fir is reported to be moderately resistant to decay, though it is somewhat susceptible to insect attack. When worked, it gives off a sweet, piney odor from the resin or pitch that the wood contains. Falling near the bottom of the Janka scale, Douglas-fir is one of the softest and least durable woods. One hundred twelve percent harder than larch but ninety-six percent softer than southern yellow pine (loblolly and shortleaf), it is only one-third as hard as santos mahogany’s ranking of 2200. Generally Douglas-fir machines well, with a small to moderate blunting effect on cutting tools. It stains, glues, and finishes well. Douglas-fir’s uses include wood flooring, plywood manufacturing, veneer, and lumber for structural and construction purposes.